It is a gonadotropin-releasing hormone antagonist (GnRH antagonist) with the generic name Ganirelix, similar to Antagon. This solution comes in a pre-filled syringe for injection to aid in vitro fertilization (IVF) treatments. This medication can help control ovulation, helping time the release of eggs so that they are mature and ready for IVF. 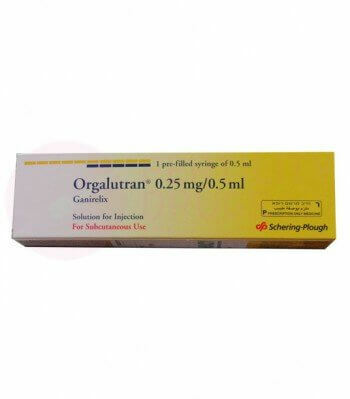 Fertility doctors usually prescribe Orgalutran to women undergoing in vitro fertilitzation (IVF) treatments or other assisted reproductive techniques (ART). When the women are taking fertility drugs for controlled ovarian hyperstimulation, to produce more eggs for harvest, this drug helps to prevent premature ovulation, which is the early release of eggs from the ovaries. When ovaries are released too early, they may not be mature and usable for IVF treatments, and the timing may not be right for the IVF technician to harvest the eggs. The drug can help control this process. Orgalutran contains the active ingredient ganirelix, which blocks receptors for the gonadotropin-releasing hormone (GnRH), a hormone naturally found in the body. Normally this GnRH will control the release of luteinizing hormone (LH), which in turn causes ovulation, the release of eggs. When the drug blocks the GnRH, the luteinizing hormone is not released, so ovulation does not occur. When doctors do want to trigger ovulation, they can stop injecting this medication and administer human chorionic gonadotropin (hCG) to trigger ovulation. This helps to control the timing of ovulation until after the eggs have properly matured. Your fertility doctor will tell you how and when to take the medication, and you can also refer to your product leaflet. You will normally start your Orgalutran shots five or six days after beginning ovarian stimulation treatments using follicle-stimulating hormone (FSH). You will likely continue to inject the drug once a day until the follicles are large enough to release a mature egg. Your dosage may be 0.25 mg once a day, injected subcutaneously, usually into the upper leg. After your Orgalutran injection, be sure to safely dispose of the needles and syringes. Always follow your doctor's directions for injecting this medicine. Seek medical attention if you experience any of these side effects. These may not be all the possible side effects of the drug. Do not use this medicine if you are allergic to it, any of its ingredients, or similar drugs. Do not inject this medication if you are pregnant or breastfeeding or if you have moderate to severe kidney or liver disease. Keep Orgalutran, other fertility drugs, needles, syringes, and other medical supplies out of the reach of children. Your fertility doctor will usually prescribe Orgalutran injections along with other injections for IVF treatments. You may first take Gonal-F or other FSH injections to stimulate follicle growth, then Orgalutran to delay ovulation until the egg is mature, then human chorionic gonadotropin (hCG) injections such as Pregnyl to trigger ovulation. You may also use fertility monitors or ovulation tests to determine when you are ovulating, and therefore the best time to get pregnant. Ovulation induction is the is the use of fertility drugs to stimulate production of multiple follicles in the ovaries, which produce eggs. Doctors may use this procedure when women experience infertility, from lack of ovulation such as in polycystic ovary syndrome (PCOS). Sometimes doctors prescribe fertility drugs to induce follicle growth for eggs to be fertilized naturally, and sometimes doctors stimulate the ovaries to produce eggs that can be used in in vitro fertilization (IVF) treatments. Drugs such as Clomid pills or gonadotropin injections can induce ovulation, treating infertility. With the high cost of IVF treatments, the cost of fertility drugs can be an extra burden on couples hoping to conceive. We help women order affordable Orgalutran and other fertility drugs, with free express shipping in an insulated styrofoam cooler for product quality. Once you have spoken to your fertility doctor to find out which fertility drugs are right for you, bring your prescription for this medication or other fertility drugs back to us. You can order this medication online or by phoning our customer service hotline, then one of our partner pharmacies will ship your order so you can control your ovulation for the best chance at pregnancy success.